2018 White Paper: Fat — The Bones & Co.
How do you feel about fat? Does the word fat make you nervous? It shouldn’t. 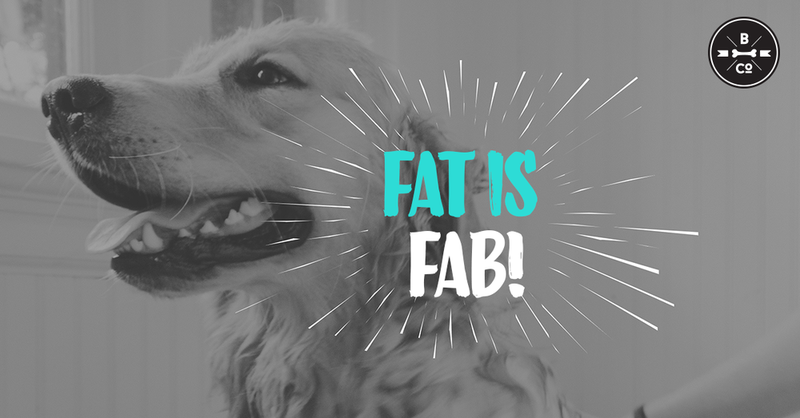 For years, dog parents have been pet fooled into thinking that fat is bad for canines. No longer: we’ll show you how carbohydrates are a major culprit for making dogs unhealthy & how fats help dogs thrive. Dig into our evidence-based look at canine anatomy, nutrition, and metabolic disease. Your pup will benefit from this knowledge. 3. We’ll be sending your $3 coupon as a thanks for joining us within 1-3 business days, straight to your inbox. Conventional dry dog foods are heavy on carbs, with most exceeding 40 to 50 percent in total carbohydrate content. This means that around half of typical dry dog food is composed of non-essential simple sugars – a fact that pet owners often aren't aware of because pet food manufacturers aren't required to list carbohydrate content on product labels. Carb intake above the daily needs of dogs (which is essentially zero) triggers internal enzyme factors to store the excess as body fat. The livers of adult dogs are able to easily synthesize glucose from protein and fats, so there is no need to supply carbohydrates in the diet. The power is yours to learn & feed em’ right.